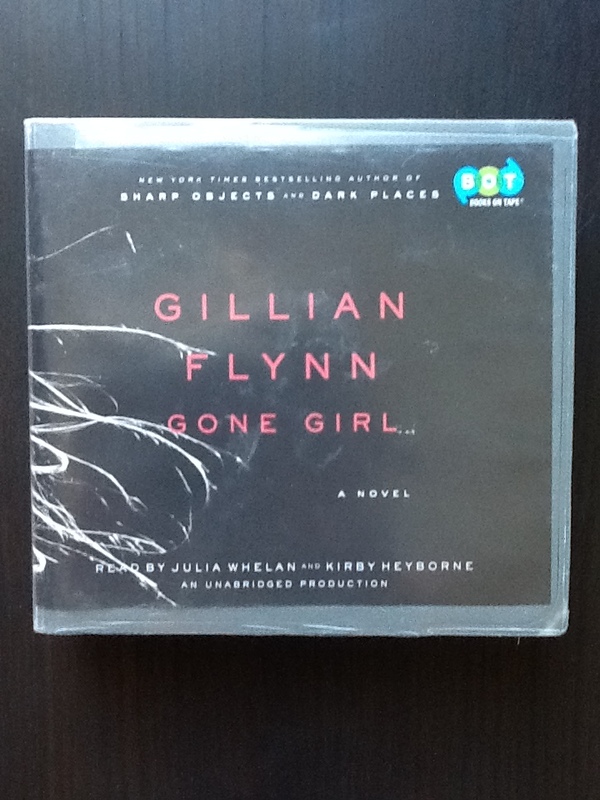 Spoiling Gone Girl – The Bookshelf of Emily J.
I listened to Gone Girl (2012) by Gillian Flynn. I never wanted to get out of my car, but alas, I had to. I read this one because a friend, Cyndi, and my sister, Haley, suggested it to me. They both gave me the warning that it was full of foul and dirty language, so I give that same caution to my friends who read this blog. That language was especially jarring since I listened to it, but the story captivated me. The book goes back and forth between the perspectives of Nick Dunne and his missing wife, Amy Elliot Dunne. Amy’s perspective is from a diary of the past, and the picture she paints is one of an unhappy marriage. From Nick’s perspective, we hear about his current thoughts following the disappearance of his wife and subsequent police investigation. He is cagey, nervous, and constantly lying. Yet I wanted to like him. I couldn’t believe that he was guilty, but all of the clues and his own odd behavior pointed to him. Now, here’s where I go into the spoilers. I just can’t resist. I NEED to talk about this book, so if you haven’t read it and you don’t want to know what everybody is calling “the twist,” then please stop reading now. You’ve had fair warning. It turns out that Nick didn’t kill Amy, but that she faked her own murder and disappearance to get back at him for having an affair. Once this side of Amy is revealed, and we start hearing her real-time story, we quickly realize that she is crazy and psychotic and a sociopath. She became angry with Nick for an affair, and instead of confronting him about it, she pretended not to know for a year and plotted framing Nick for her murder. The diary we see is fabricated, with her carefully writing in different color inks and cross checking dates to her fake entries. She even cut herself and bled on the kitchen floor, and then cleaned it up. She faked the crime scene so obviously that the police would know it. She also charged some $200,000 on credit cards in Nick’s name, without his knowledge, put his fingerprints on all of the stuff while he slept, and then hid it in his sister’s shed. Of course, Nick finds it because of a “treasure” hunt she leaves behind. It is their annual ritual for celebrating their anniversary, and she planned her disappearance on their five-year anniversary. As this narrative unfolds, we realize just how many lengths she will go to frame Nick, and the purpose becomes to keep Nick under her spell. It’s crazy. That is really the only word for it. Yet I could identify with the narrative. I thought of several people I know that I believe are capable of Amy’s actions. Perhaps they do not possess the same capability on an intellectual scale (for Amy is wickedly smart) or on a grandiose scale, but nevertheless, I know people who hate enough to punish over and over again and who always believe themselves to the be the victim, even when they are to blame. And surely, Amy is to blame in this situation, despite Nick’s affair. His actions do not justify hers. Now, if you read this book, I suggest reading it with a friend or identifying somebody you can talk to about it as you read because they have read it too. I couldn’t stop talking about this with my sister. I had to keep calling her and hashing it out. I had to keep guessing at what the twist would be. I wanted it figure it out before it happened. I’m sad to say that none of my theories came to pass, and just when I started suspecting Amy herself, the book confirmed it. I didn’t figure it out first. Enjoy! I hope you didn’t read the spoiler part! I finally read Gone Girl and the only part that I did not like was the ending. I am waiting on Sharp Places from the library now. The ending is somewhat dissatisfying for sure! I haven’t read the other one, but maybe I should. Let me know if it is good. I read Gone Girl last year. That is quite something that you know people who hate as much as Amy does. I found her disturbingly, disturbingly scary. I didn’t like the ending. I wanted her to pay her dues, but maybe she and Nick just deserve each other. I don’t know that book. But it sounds intriguing. And sorry, no, I haven’t seen Amour! 🙂 Yeah, they did deserve each other, but I did want to see her punished. That part was unsatisfying to me. I stopped reading but I am intrigued by this book now. Don’t let me spoil it for you! I stopped when you said. So I am grateful you said that. Although I am not sure when I will get around to it as my TBR pile is kind of out of control atm. But what I did read, has made me definite that I want to read this book now. Mine too! There is never enough time for all that I want to read. What are you reading at present? I have just started Ali McNamara’s From Notting Hill To New York Actually. I read this book in two days flat! what’s that saying about great art? great art should make the comfortable uncomfortable..,loved loved loved this book. I like that definition. True! I read Gone Girl a few months back. The mind games were chilling; the fact that I was reading it at one in the morning didn’t help. But the narrative was pretty powerful and I loved reading it. Ha! 1 a.m.? That would make it even more disturbing! That is credit to the writer, for sure. I think hating main characters is one of the main reasons, according to an infographic from Goodreads, that people quit books. It’s probably the main reason I do. That and bad dialouge. I loved this book and have read her other 2 too (Dark Places and Sharp Objects). All of them are great!!! Loved your post. I’ve decided the author, Gillian Flynn, must truly be insane. I just don’t understand where she comes up with this stuff!! Really great books to read! LOL! Maybe she can write Amy because she IS Amy. I didn’t read the spoilers because I’m really excited to knock this one off of my To-Read shelf! I’ll try to remember to come back and discuss when I finish it! The two of them were so much fun to hate! I got a kick out of this novel. Am I remembering correctly that you were able to figure out the twist before you got there? I kept thinking of that as I read. I felt like I let myself down intellectually for not getting it! I don’t think I had it figured out — maybe an inkling, but not the whole thing. The last mystery-ish book I read was Bay of Fires, and that one I had mostly figured out. Mostly. I am reading this now, so I am going to skip reading your post–for now. I look forward to reading your thoughts when I am finished. So far, I am liking the book. Smart choice! I think what really warms my heart from all of these comments is that other readers like to be surprised as much as I do. I know people who skip to the end of a book first, and that is NOT how I prefer to read at all! I think the ending was genius because it sparked the need to talk about it. How would we behave? Now what? Should it have gone another way? Nice post! That’s so true. We wouldn’t be as torn or still thinking about it if it had turned out all nice and neat. I loved it, too. I couldn’t put it down. There’s something about finding complex characters in literature these days. I was completely shocked at the twist in the plot as well. I was rooting for Nick too. I never really believed he did it. And I loved the stalker boyfriend too…creepy. Yes, totally creepy. He did NOT deserve to die, though. That’s where I started really despising Amy, when before I was mostly shocked by her audacity. Loved it too- but honestly by the end of the book I was actually hoping one of them would really kill the other! Oh my gosh. You are hilarious! I was worried that they were going to end up that way. I had the same feeling of wanting to discuss it in lengths with someone… anyone! Since I was the first among friends to read it, I resorted to tweeting my reactions, which made me look like talking to myself! I then convinced my colleague to read it, and she had the same sentiments! It’s been more than a month, but this story still haunts me. What did you think about the ending, though? It felt wrong at first (to not have at least one casualty haha), but later on, I realized, it was the most apt ending for this sick and twisted “love story”. Their personalities are so destructive and I can’t help but wonder what happens to them for the rest of their days. I felt dissatisfied with the ending at first. I really wanted her to be punished. But it did grow on me and it does make sense given that both of them deserve punishment but there’s no way to accomplish that without pitting them against each other. I understand completely! I told my husband every play by play in the book so that I would have someone to talk it out with. I was not expecting part two at all; it was such a great twist. I thoroughly enjoyed the book and storyline, but did not like the ending AT ALL. I’m not sure why, but I think I leaned more towards liking Nick in the book and I didn’t want him to stay with her. I kind of hoped he got his revenge. Oh well! I hoped for that too. Maybe the best revenge is to live well, and by sticking around for that baby he’ll get his revenge. I did want to see her caught, especially by the female detective! It was a book full of crazy twists and turns, and you’re right, it was impossible to predict how it was going to turn out. I was rooting for him all the time, but the evidence was so damning, I wasn’t sure till the end that I was rooting for the right team! I agree. It was hard to know how to feel or who to pull for. I absolutely love Gillian Flynn’s writing style! I love your observations on Gone Girl also:-). I read all three of her novels, and although some people may criticize her for dark or “unlike able” characters, I always appreciate a character who is a product of their upbringing or life experiences! I believe Libby in Dark Places is definitely a character that is troubled by her past and Gillian Flynn portrays her characters with flaws and all very masterfully! I’m addicted to reading and I can’t wait to hear more of your thoughts on other awesome books! Addicted to reading? Me, too! 🙂 You make me want to read more of her work. I like dark too. I read it quickly but was disappointed in the ending. I had imagined other outcomes. A good book but overrated in my opinion. Me, too. I wanted more closure. Tough call. I say go for it, but I love dark and twisted. I’ve been having an extremely difficult time finding non-fiction that I can get in to lately. I just stumbled on your blog today and it looks like you have so great suggestions. I look forward to checking some of them out. I’m sorry to hear that. I hope my blog is helpful. A while back, I did a series of posts called A Week of Nonfiction in which I listed fifteen books I enjoyed. Good luck finding something. I know how that can be! I also ‘read’ this book with audio via my trips back and forth to school and home almost a year ago. I was freaked out by the whole thing, and frequently replayed parts that were particularly unnerving. I could have benefited by hashing this out with a friend, like you did with your sister. A writer myself, I could not even imagine a fictional character with this depth of anger and devious actions towards someone she loved. I was shaken by the horror of what this wife dreamed up. I was really dejected by the ending, since the antagonist won out. I wanted the protagonist to turn the tables and it just didn’t happen. I had a momentary pang of my heartstrings, needing the good guy to win out. Ingenious, but left me with a real feeling of dread. A shocking, chilling read. Definitely shocking and chilling! Your characterization of Amy as antagonist and Nick as protagonist has me thinking. Do you think they were both antagonists? Is anybody really the “good” guy here? I’ve been mulling this over after talking to another friend about this book. Pingback: A Disturbing Book: Sharp Objects | The Bookshelf of Emily J.